WE ARE SO GRATEFUL FOR OUR GENEROUS SPONSORS! Get a bang for your buck! TFAE 5K Run for Excellence provides an audience of thousands to our sponsors. Don't miss this unique opportunity! Click the pdf to learn more about our sponsorship opportunities. 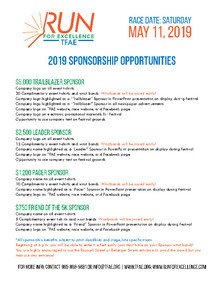 Download "TFAE 5K 2019 Sponsorship Opportunities.pdf"
The Run for Excellence is the primary fundraiser for TFAE. The funds are used to help local educators fund their programs through grants. With over $1,000,000 in grants awarded to local educators, TFAE has become a valuable source for Terrebonne’s public schools– funding various projects including google classrooms with Chromebooks. So, come out and join us for good music, great food and the most happening all-inclusive after party! Copyright ©2019 TFAE Race for Excellence. All Rights Reserved.